The ADAPT Centre for Digital Content Technology will work with academics from University of Limerick on a new €5 million research programme to advance innovations in Blockchain and financial technology research. 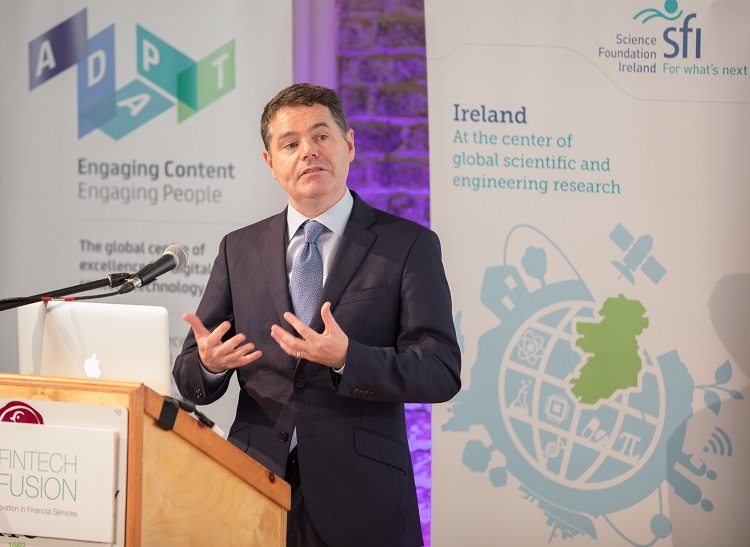 Minister for Finance and Public Expenditure and Reform, Paschal Donohoe TD, and ADAPT, an SFI Research Centre, have announced the new Financial Technology (FinTech) research programme, FinTech Fusion. The academic and industry research partnership will encourage breakthroughs in payment (PayTech), regulation (RegTech) and insurance (InsureTech) technologies by accelerating scientific progress and enabling data-driven research. The rapid advancements in Artificial Intelligence, mobile applications, cloud computing, Big Data analytics and distributed ledger technology such as Blockchain has demanded organisations change in order to remain competitive. FinTech Fusion’s research programme will address how financial technology is disrupting and transforming businesses from financial institutions to technology companies, along with the retail and wholesale financial sector, and lead on innovations that are capable of creating significant change in financial services, on a global scale. The research will focus on three main areas – payments, insurance and regulation. Dr Finbarr Murphy, Dr Martin Mullin and Professor Bashar Nuseibeh, from UL and Lero, the Irish Software Research Centre, form part of the team and will work in the area of risk management. Distributed ledger systems are providing alternative payment systems that are faster, cheaper, and more transparent and mobile payments systems are providing compelling alternatives to traditional banking. Technological innovations such as blockchain-based frameworks can reduce human intervention and fraud while increasing transparency and efficiency, helping to transform the insurance industry. The role of regulatory compliance and the implication of RegTech in the new world of data-driven finance will require state-of-the-art tools for risk prediction and mitigating costly threats. These new technologies are putting pressure on the business models of traditional financial services and how banks and companies react to this disruption will define their future success. FinTech Fusion’s academic researchers will work together with more than a dozen companies including Deutsche Börse, Fidelity Investments, Microsoft, Gecko Governance, FINEOS and Zurich, to develop FinTech innovations that will have the potential to impact economies, markets, companies and individuals. FinTech Fusion will be led by the ADAPT SFI Research Centre, headquartered at Trinity College Dublin and funded by Science Foundation Ireland. It will involve researchers from three existing SFI Research Centres – ADAPT, Insight and Lero, the University of Limerick hosted Irish Software Research Centre. It is also supported by the IDA, FinTech and Payments Association of Ireland, Insurance Ireland, and Columbia University. FinTech Fusion’s research programme will run for four years from 2018 to 2022.